At 60 years of age, she is tired – and yet Ms. Selvayohini continues to search for her son, who has been missing for twelve years He would now be 32. Many young people like Selvayohini’s son were caught in the 26 year-long war between the terrorist organization LTTE (Liberation Tigers of Tamil Eelam) and the Sri Lankan government, have gone missing and are presumed dead. 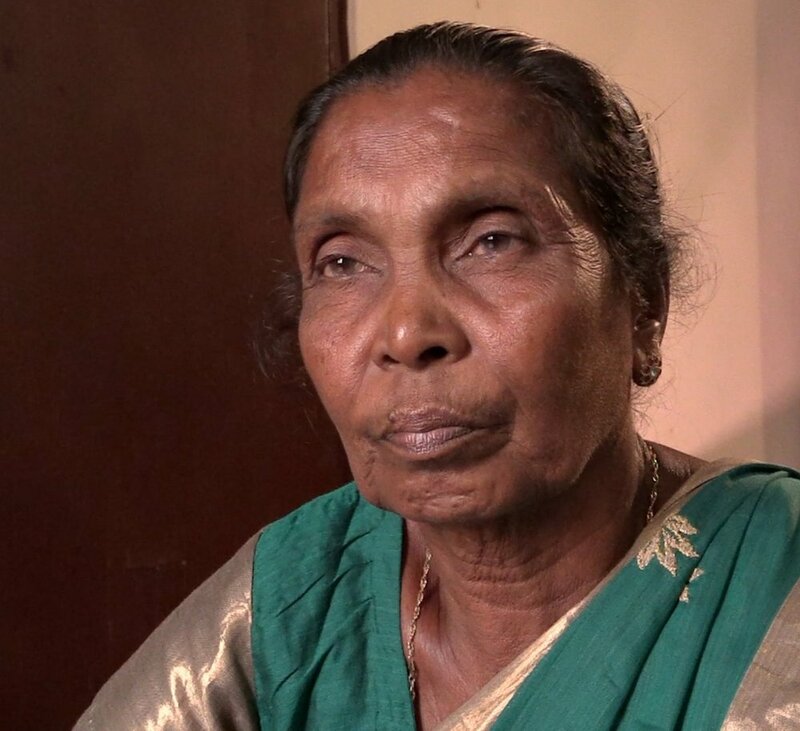 Activist Selvayohini tells of her son’s 12-year disappearance after a punishing war. It was Selvayohini’s indomitable spirit that led her to participate in one of OMNIA’s Interfaith Peacemaker Teams in Jaffna in the northern province of Sri Lanka where 8 years ago, the war raged. She was one of 65 Sri Lankan activists, theologians, educators, and government workers who attended OMNIA’s Interfaith Peacemaker Teams training events in Sri Lanka’s capital city, Colombo, and in Kandy, where extremist Buddhist mobs engaged in violent attacks against Muslims a few months ago. “I came because OMNIA gives me hope of finding my son,” she said through tears. Hope. It was a theme heard often over the past two weeks in both Sri Lanka and Nigeria where local OMNIA leaders have conducted simultaneous training events in its campaign to build community based Interfaith Peacemaker Teams in conflict regions around the world. This most recent heightened activity on two troubled continents signals both a sense of urgency and a recognition of OMNIA’s significance as a proven and relevant power in addressing the growing Selvayohiniglobal tensions through its Interfaith Peacemaker Teams. In Colombo, fifteen leaders from the Northern and Eastern provincesreceived advanced training, which gave them skills to lead Interfaith Peacemaker Teams. They had previously participated in the basic training. Rev. Sathian Kadirgamar, a retired Methodst pastor, and one of OMNIA’s key organizers has led the formation of six Interfaith Peacemaker Teams in these areas. In the Kandy region, where tensions between Buddhist extremists and Muslims continue to flare, Anglican Bishop Kumara Illangasinghe organized OMNIA Interfaith Peacemaker Team training events for more than 50 Buddhist, Hindu, Muslim and Christian leaders. Led by OMNIA staff, this brings the number of leaders trained in Sri Lanka within the past year to 185. OMNIA President Premawardhana with Leader of Buddhist Delegation to OMNIA’s Opening Reception in Kandy. While in Kandy, members of the OMNIA team visited the village of Digana, where Buddhist extremist violence wrecked Muslim communities six months ago. They heard stories of struggle and survival from villagers where Muslims were beaten and killed, and Muslim-owned businesses and mosques were burned. These struggles “from the ground” form the foundation of OMNIA’s training and informs its strategy as Interfaith Peacemaker Teams engage their communities for peace. As teams were being formed in Sri Lanka, OMNIA leader in Nigeria, Rev. Abare Kallah, together with his team Rev. Isaac Laudarji and Malam Rabiu Aliyu held a successful three-day long training for Interfaith Peacemaker Teams, drawing more than 50 Muslim and Christian leaders, Community leaders and leaders of local NGOs, bringing the total of OMNIA-trained leaders in Nigeria to 720. More than 50 Interfaith Peacemaker Teams are now active in the city of Gombe, with more to be established next month. OMNIA was at work on a third front, as OMNIA women's teams organizer Soraya Deen held day-long training events for more than 150 women in Sri Lanka’s Jaffna, Vavuniya, Mannar and Nuwara Eliya. She also spoke at or moderated several high-profile events, including one that featured Hon. Mano Ganesan, the Minister for National Integration, and an acclaimed Buddhist leader, Ven. Galkande Dhammananda Thero, the director of the Walpola Rahula Institute. Learn more about OMNIA Interfaith Peacemaker Teams here.